May 8, 2015 —- The membership of Penn Staters for Responsible Stewardship congratulates Anthony Lubrano, Ryan McCombie and Robert Tribeck on being elected by the university’s alumni to serve as Penn State trustees. PS4RS endorsed all three alumni-elected trustees, who will serve three-year terms that begin on July 1, 2015. Schmidt also highlighted the strengths that Tribeck, a new trustee, will bring to the board as he takes as seat alongside the eight other alumni-elected trustees, all of whom were also endorsed by the organization. “Rob is extremely knowledgeable, principled and tenacious,” Schmidt said. “We are confident that he will be fully engaged from day one. Rob is perfectly positioned to provide a legal perspective in our fight for the repudiation of the board’s ill-conceived Freeh Report, which has caused extensive financial and reputational damage to the university. In fact, Rob was the principle architect of the PS4RS Freeh Report Analysis, the first review that detailed the flaws of Louis Freeh’s $8+ million ‘independent investigation,’ which is now under intense scrutiny. 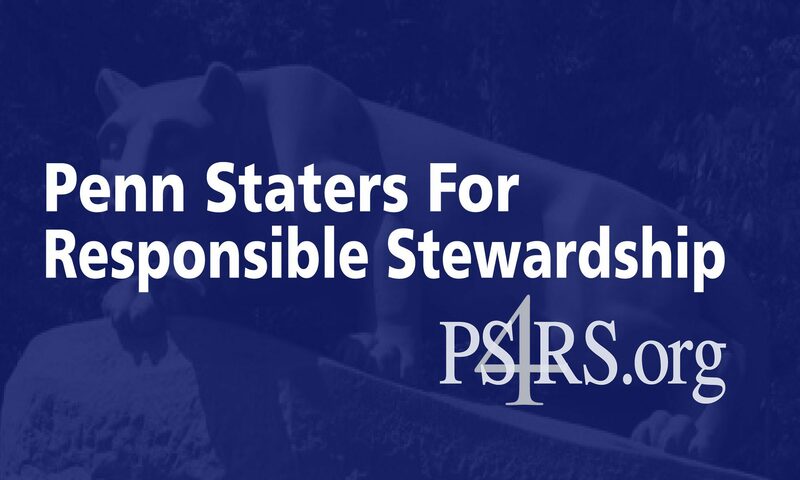 Penn Staters for Responsible Stewardship, with more than 40,000 members nationwide, was formed to promote positive change within the University Board of Trustees, demanding transparent, trustworthy leadership. For further information on PS4RS, please visit www.PS4RS.org, email ps4rsinfo@ps4rs.org, or go to http://www.facebook.com/PS4RS. Follow PS4RS on Twitter at @PS4RS.